After we all ate our own versions of breakfast from the free breakfast in the hotel lobby we decided to go to the mall…no wait the shopping center…no wait cave creek…wait where are we going?! 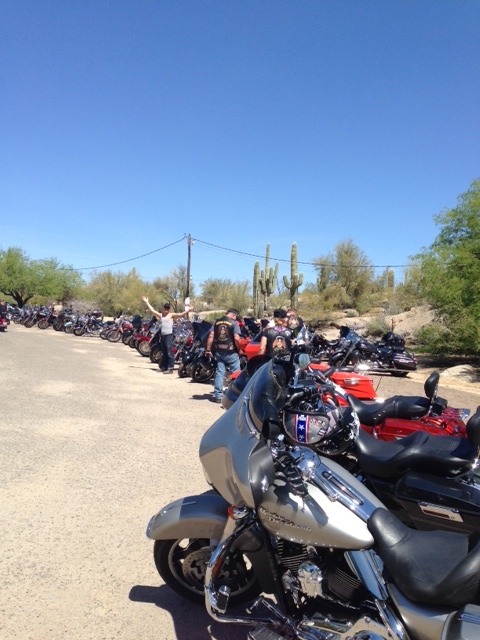 Eventually we all decided we would load up on the bikes and head out to Cave Creek. I hadn’t even heard of this place prior to today, but I am glad we made the trip! It was a pretty drive, not too far, but awesome scenery and some really nice houses up in the mountains, plus some really cool boulders. 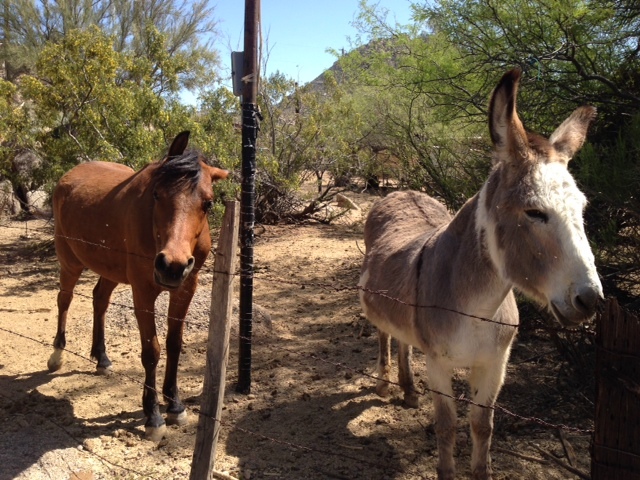 We drove through Care Free, AZ on our way to Cave Creek. Once we got into Cave Creek we got separated by a few cars between each of the bikes. I guess we were coming in right after a parade, so one side of the street was shut down and traffic was crawling. It was super hot today, so sitting on the bikes going 1mph was getting old quick. As we kept going down the road we passed a few lots with parking, but the leaders were trying to make it to the American Legion…since most of this crew was Legion Riders. Eventually they gave up and we turned around and pulled into The Horny Toad. 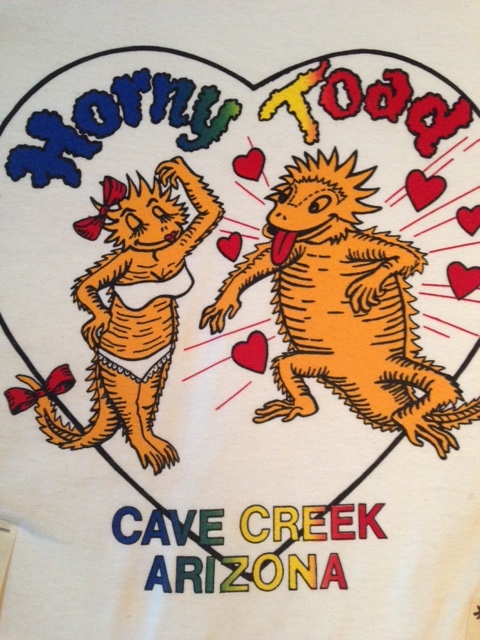 The Horny Toad was a cool establishment that had a bar/restaurant, a couple of shops and a big parking lot. We got some drinks to quench the thirst from the hot ride and checked out the shops. Then we headed up the road to see what else was going on. We got to the main section of the biker party, that was this really cool outdoor bar with a bunch of vendors all set up around it. 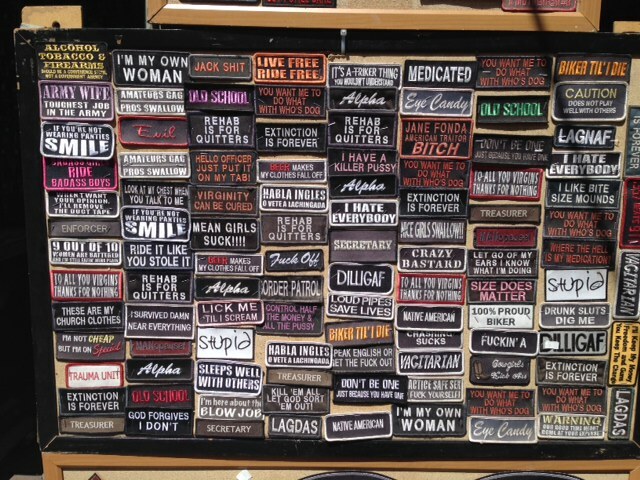 I bought a couple of cute shirts and we all spent some time checking out all the vendors. 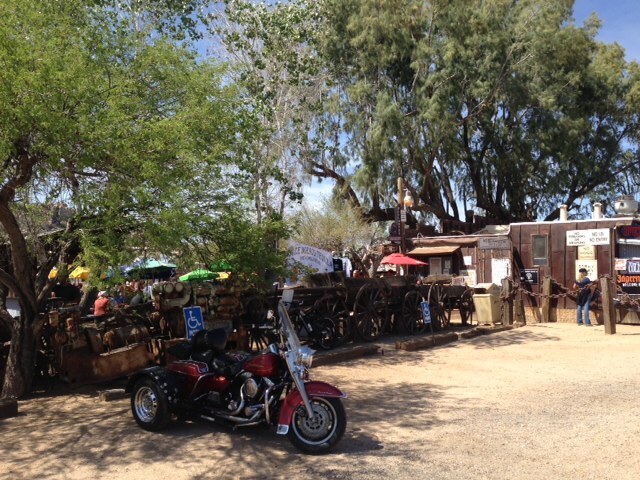 We all gathered back at the bar and decided we would continue on our journey and go to Greasewood Flats. 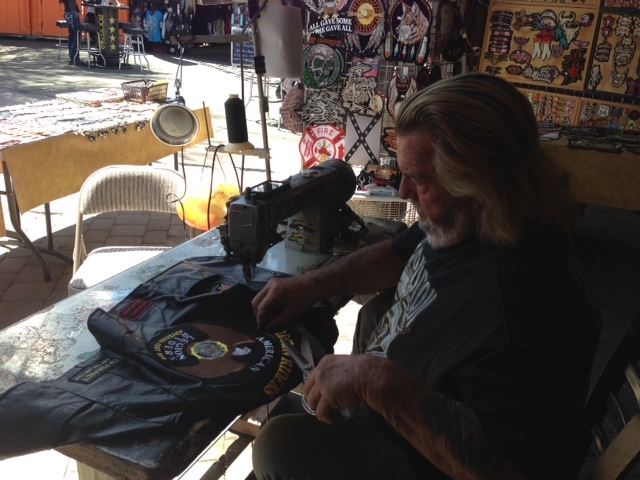 There was a lot more going on at Cave Creek, and we probably could have spent most of the day out there, but we wanted to get on our bikes and ride! 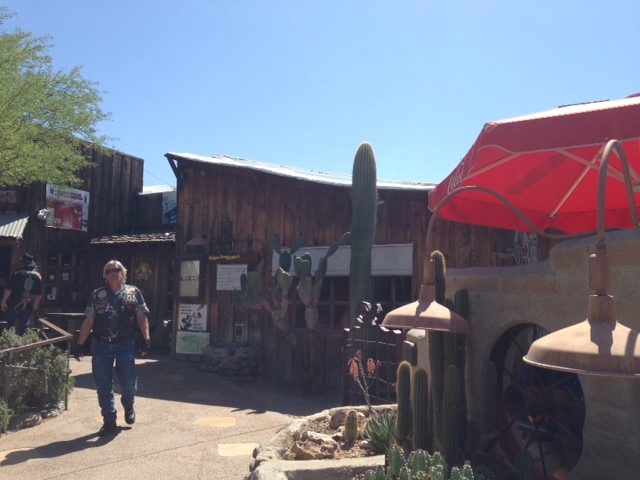 Greasewood Flats is a bit of a challenge to describe. It is a bit like the Tug Bar (for those of you that live in AK) it is a bar but has several buildings on the property and is a bit like an old ranch of sorts. There were bands playing all day out there and a few vendors and food options. 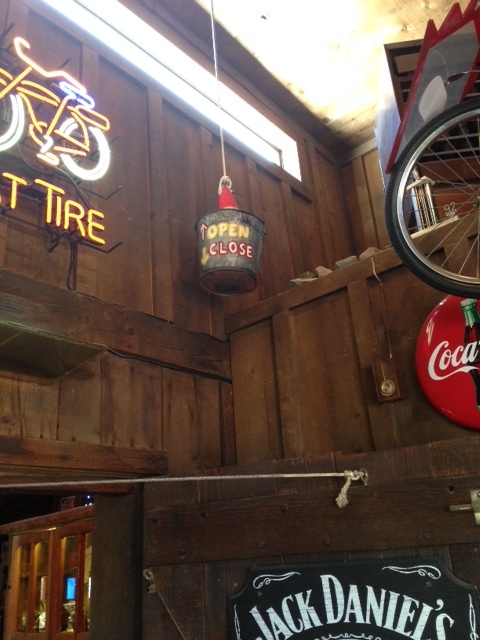 From what Jerry, Carol, Mark, Jan, Tom and Anne said the green chili burgers were awesome. I settled for some chips and salsa and we sought shade in one of the building on the property where we ended up having our own private party. I imagine it fills up quite a bit later on in the day, but we just caught the beginning. After eating some brownies we meandered back to our bikes. It was getting pretty hot so we decided to head back to the hotel to cool off and get some rest. We regrouped in the lobby at 4:30 to head to the Tilted Kilt. The whole group except for Jon and I took the hotel shuttle to the bar so they could have a few adult beverages and not ride. The Tilted Kilt is like a Hooters in Scotland. Despite the tacky atmosphere the food was actually really good. We got a bunch of appetizers and we all watched the Arizona State game against Wisconsin. When in AZ, you pretend like that is your team too, so we all were bummed to see them lose. The rest of the crew headed back to the hotel, they are all riding back to Tucson tomorrow, while Jon and I are going to stay in Phoenix another day. Jon and I rode down to the other side of Scottsdale Rd. to hang out in the cool area we found when we were here a couple months ago. Eventually were tired of walking around so we decided to head back here to get some rest. 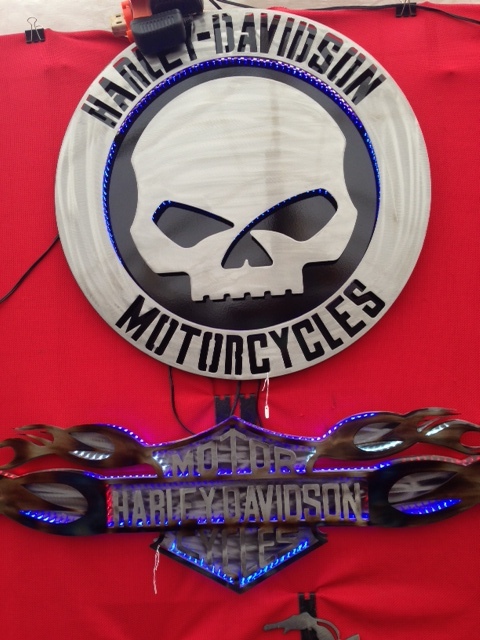 Tomorrow we are going to check out a big bike show and some other cool stuff. This entry was posted in Uncategorized and tagged adventure, Alaska, alaska bikers, alaska highway, American Legion, Arizona, biker girls, biker party, Bikers, dealership, harley davidson motorcycles, harley shop, Harley-Davidson, hd110, Horny Toad, journey, Motorcycles, ride, riders, road trip, transportation, travel, women, women riders. Bookmark the permalink.